Reliable and valid health information is vital to the health care industry, to researchers, and legal and financial professionals. Public health officials depend on medical records for information about disease patterns and general health conditions. Hospitals depend on accurate medical records for patient care, health statistics, reimbursement and protection in medico-legal matters. These programs are online and require that you have access to the Internet and have basic computer skills. Graduates of this program will find a wide variety of exciting career opportunities in ambulatory health care facilities, industrial clinics, state and federal health agencies, skilled and intermediate care nursing facilities, the insurance industry, managed care organizations, and hospitals. 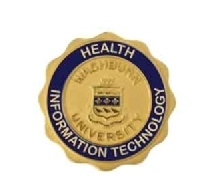 The following data is provided regarding the health information technology program offered by Washburn University. The data is based on graduates of the associate degree program during the period August 1, 2016 through July 31, 2017.